This weekend, I’m going to Buffalo. Saturday morning, I will get up early, shower and dress, throw a few things into a duffel bag (do they still call them duffel bags? ), and down coffee while I wait for one of my best friends to arrive — her husband is dropping her off around 8. After my goodbye to Steve and air-kisses to my still-sleeping teenaged kids, we girls will make our way from my house in Mississauga to another longtime friend’s home 10 minutes away in Oakville. Then the 3 of us will hop on the QEW and, barring the odd Timmie’s pitstop, will be Fort Erie bound. Because down past Fort Erie, on the other side of the Peace Bridge, we’ll hook up with 2 more BFFs — they’re driving down separately — and for the next 24 hours, I will immerse myself in a lifetime of memories of wonderful trips to this terrific city for shopping and a whole lot more. Buffalo is a longstanding tradition for me, in part because it was a bit of a hobby for my dad. A freelance writer and all-around eccentric guy, he loved Buffalo. Not shopping there. 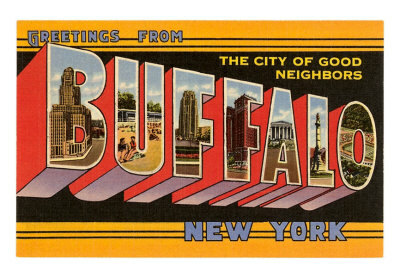 Well, yes, he liked that too, but what he really loved about Buffalo was its no-nonsense common sense. A place with simple, good food, well-prepared by straightforward people with an indomitable spirit. A multi-cultural “middle American” city built on a lot of sweat and a lot of Bethlehem Steel — and in recent decades, a city that has seen hard times. My dad translated this love into magazine articles. He researched the city. Visited well-known landmarks. Found out-of-the-way places to eat. He even interviewed Irv Weinstein. As a result, long before cross-border shopping was trendy for Torontonians, my dad and mom would pack us kids up in the Buick station wagon and shuffle us all down for a night or two. We’d stay at the Holiday Inn, or Sheraton, or — very often — the beloved Williamsville Inn in (you guessed it) Williamsville, which is a quaint village-unto-itself in the Town of Amherst, on Buffalo’s western outskirts. As far as I can see online, the Williamsville Inn is no more. What was so special about it? Well, it was just this cozy, inexpensive, independently- and well-run motel that had a great restaurant, the friendliest receptionist south of the Erie Canal, and close proximity to Transit Road. Ah… Transit Road. It is and was a sprawling, rather ugly north-south thoroughfare of plazas, motels and chain restaurants (think Dundas and Dixie, or Yonge Street north of Finch). But back in the 70s and 80s, before the likes of Walmart, Payless and Target migrated north, Transit Road was Mecca. It was home to the Eastern Hills Mall (we’re talking pre-Walden Galleria, which didn’t open until 1989)… the Buffalo Brew Pub (the first place I knew of where you could throw peanut shells on the floor)… Premier Liquor (the selection! the prices! )… and super duper supermarkets like Tops and Wegmans (where I marveled at the shelves of strange and wonderful snacks and, a few years later, the strange and wonderful beer). But for me, the real drawing card of Transit Road was a tucked-away little warehouse of a place called Syms. Everyone who watched Buffalo television knew that at Syms, an educated consumer was their best customer (the same way we all knew Commander Tom and the fact that Buffalo was Talking Proud). Long before there was Winners, there was Syms. At Syms, I got to know names like Bill Blass, Geoffrey Beene, Donna Karan, Ralph Lauren, Betsey Johnson… God, I was in heaven in that place. It had the best deals on the big names. And never mind “we only have it in puce” and “all the 10s are gone”; at Syms, they had it. They got it. They understood retail and, to my mind, delivered what it seemed Canadian retail has never quite mastered. Real discounts. Genuine customer service — provided by people who know their stock and are proud to offer great products. Upscale décor? Nope. Fancy packaging? Nada. Black painted walls, rolling racks and open communal dressing rooms? You got it. But boy, it was worth it. Many people who know me will know that I don’t eat chicken wings because I no longer eat meat. But that doesn’t take away from the fond personal memories I have of the Anchor Bar and the fact that it’s just about one of the most charismatic, appealing and eclectic eateries I know of. I remember great visits I had as a kid with my parents (all of us counting row upon row of license plates on the walls), and later, piling in with groups of friends, all of us tucking into big plates of food washed down by bigger pitchers of beer. I also remember being there one time with my mom and best friend and her mom (a girls’ weekend for the 4 of us), and we listened to some fabulous live jazz. Sweet. Will the girls and I make it there this weekend? Maybe on Sunday, as we head downtown back toward the Peace Bridge. We’re staying where we usually do, at the Millennium Hotel, conveniently located next to the Walden Galleria. Yes, I know how suburban and consumerist it all sounds. But on this one pre-Black Friday weekend of the year when we do this — all 5 of us (some of us friends since kindergarten and grade school) — the operative word is convenience. It’s about easy. Simple. No fuss. No muss. We’ve tried in the past to be bohemian and adventurous and stay in different hotels and eat in restaurants other than P.F. Chang’s and The Melting Pot. But you know what? We don’t care. We’re there for each other. To hang out. Talk. Be goofy. Catch up. Drink. Play fashion show. And just have fun. So, it’s like, whatever works. And the Millennium Hotel, across the road from the mall and an overpass away from Target, works perfectly. So as I slowly pull up to the customs booth and politely hand over my passport to the officer, and then slide down onto I-190 South and cruise through the downtown core, I will think not only about this trip and the lifelong friends I’m lucky enough to share it with, but about many trips taken down to the Queen City and all the treasures discovered there, from Parkside Candies and Freddie’s Donuts to Allentown and Frank Lloyd Wright. This entry was tagged Buffalo, Sy Syms, Transit Road. Bookmark the permalink.